As this is the top destination in Greece, things to do in Santorini are many. Touring to the volcano, walking along the caldera path from Fira to Oia and shopping are the most popular activities on the island. Shops in Santorini island vary from small souvenir stores to international brands. Most beaches in Santorini are organized and have watersports centres with fun games. Diving centres also have their base in the beaches of Santorini, offering courses and diving trips to close islands, old wrecks and the volcano. Trekking paths are also available in the island. Discover the island with more than 10 tours and excursions proposed. Diving centers in Santorini organize courses and diving trips at the caldera. Discover the famous wineries of Santorini, offering wine tasting tours for some of them. Discover the local products of Santorini island in Cyclades. Most Santorini shops are found in Fira and Oia, the two most popular villages on the island. Discover the secrets of the island on beautiful sailing boats. Enjoy a movie in one of the open-air cinemas of the island. The popular beaches of Santorini are lined up with many watersports centers. Discover the windsurfing and kitesurfing spots of the island. Discover the beautiful nature of Santorini by hiking on amazing paths. 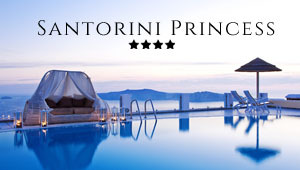 Discover some spa and massages centers in Santorini. Take some yoga courses to to revive your spirit while in Santorini. Discover the available workshops of Santorini island. Santorini organizes thousands of weddings every year.